Its never nice seeing someone pain and this also applies to your pet. Like seeing your own child in pain it can be a terrible feeling when you see that your dog is clearly suffering and you aren’t quite sure what to do about it. Its never easy dealing with this kind of trauma, and as dogs can’t talk it can make it even more difficult to diagnose what is wrong, but if your dog is suffering from an injury or illness there are a few steps that you can take to put them back on the right track. Although a trip to the VET might be the first stop for a dog in pain, if you find that this doesn’t work, or that the pain is on-going then you could very well try over-the-counter medicines as a cheaper and sometimes far more effective medication. You may also try herbal/natural products which can also have health benefits for your dog without the side effects of common medications. Below are some popular ideas for treating your dog at home. Please remember: Like humans, every dog is individual and will react differently to pain medication. Seek professional advice if you aren’t certain about what you are administering to your dog as an allergic reaction could occur. Natural supplements these are relatively low-risk treatments for your dog and when taken regularly they can have a direct impact on the overall health of your dog. Natural health products can help to build up and support your dog’s immune system as well as maintaining their joint structure and generally keeping them feeling well  after all, a healthy dog is a happy dog! Over-the-counter medications many people treat their dogs in a similar way to humans and offer them over-the-counter medicines, and these do work for many people. Giving your dog aspirin can often have the same impact that it does on a human helping to deal with the pain and this is often used in the treatment of a range of muscle-related illnesses to help reduce the pain that your pet feels. NSAIDS and associated products we often use these to reduce swelling and so can your dog. 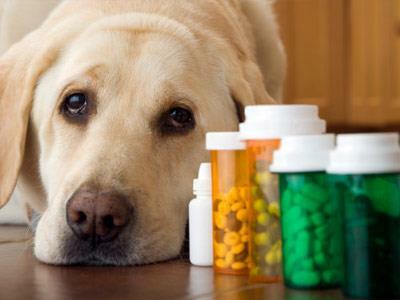 The majority of NSAIDS are safe for your pet to use, but make sure that you always check the label first! These are particularly popular in the treatment of long-term muscular injuries as a way of keeping the swelling down and allowing the injuries to heal. So if you are looking to nurse your dog back to health, it’s always worth looking towards natural supplements and health products as a way to keep your dog healthy and ensure that they are getting exactly what they need for a swift and effective recovery.